Sustainable Match offers business insights for trade missions agencies, NGOs and governmental policy makers looking for ways to create sustainable business matches based on sustainable trade and inclusive business models. 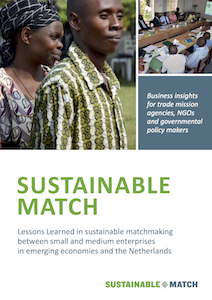 In 2012-2013 Sustainable Match developed an innovative approach to combine sustainability and matchmaking between small and medium enterprises (SMEs) in emerging economies and The Netherlands. This website shares with you its best practices and lessons learned in sustainable matchmaking within the private sector. The methodology is of interest to anyone actively involved in private sector development and international cooperation to further create sustainable and inclusive business worldwide. Sustainable Match is an initiative of MVO Nederland, Agri-ProFocus, Oxfam Novib, PeopleConnector, ProPortion and BBO. The project was financed by the Dutch Ministry of Foreign Affairs and co-financed by Oxfam Novib, Agri-ProFocus and MVO Nederland.